Although the two example queries appear to be quite similar (both compute a grouped count aggregate), they differ in one important aspect: - The first query updates previously emitted results, i.e., the changelog stream that defines the result table contains INSERT and UPDATE changes. - The second query only appends to the result table, i.e., the changelog stream of the result table only consists of INSERT changes. Whether a query produces an append-only table or an updated table has some implications: - Queries that produce update changes usually have to maintain more state (see the following section). - The conversion of an append-only table into a stream is different from the conversion of an updated table (see the Table to Stream Conversion section). The Table API & SQL assume that in both cases timestamps and watermarks have been generated in the underlying DataStream API before. 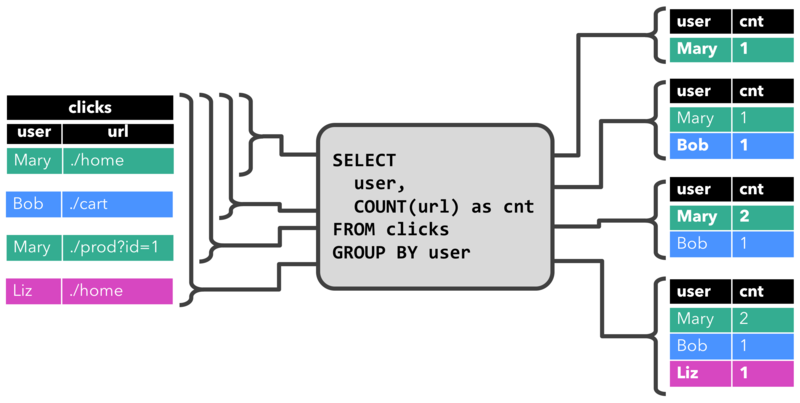 Ideally, this happens within a TableSource with knowledge about the incoming data’s characteristics and is hidden from the end user of the API. The event time attribute is defined with the .rowtime property during schema definition. Timestamps and watermarks must have been assigned in the DataStream that is converted. Replacing a physical field by a logical field (e.g. because it is no longer needed after timestamp extraction). The event time attribute is defined by a TableSource that implements the DefinedRowtimeAttribute interface. The logical time attribute is appended to the physical schema defined by the return type of the TableSource. Timestamps and watermarks must be assigned in the stream that is returned by the getDataStream() method. In the the following we describe the parameters of the QueryConfig and how they affect the accuracy and resource consumption of a query. There are two parameters to configure the idle state retention time: - The minimum idle state retention time defines how long the state of an inactive key is at least kept before it is removed. - The maximum idle state retention time defines how long the state of an inactive key is at most kept before it is removed.